“How could I not have known this before now?” I whispered to Euan as we listened to tranquil birdsong and slowly paced the beautiful land that was once used for mass killings and graves. 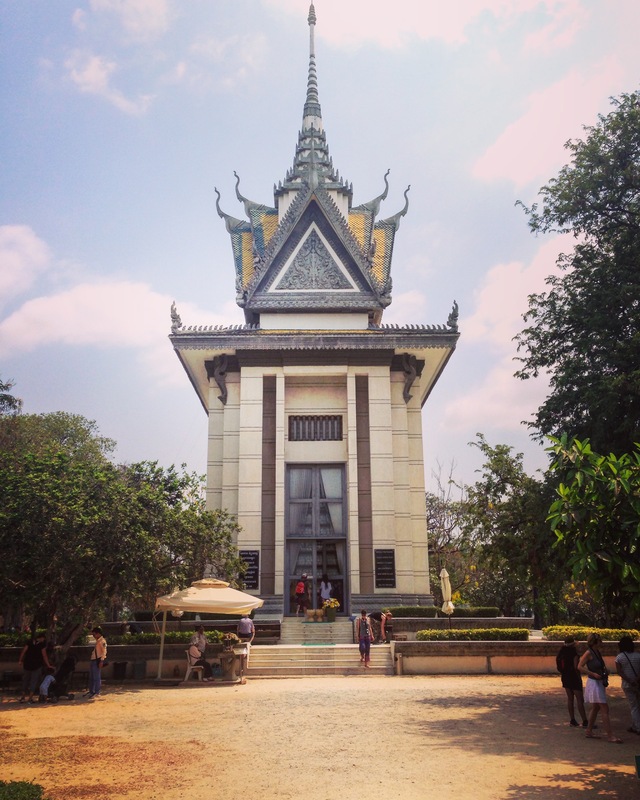 We were at Choeung Ek, the largest site of a group that is collectively known as ‘The Killing Fields’, 15km outside of Cambodia’s largest city, Phnom Penh. I had just listened to the opening sequence on the audio aid that all visitors are given upon entering the site. “Almost three million people were killed in between 1975 – 1979 by Pol Pot and his Khymer Rouge soldiers under his communist regime.” Three million poor innocent people were dragged to sites like this all over Cambodia and killed mercilessly, for nothing more than living in cities and owning possessions that were seen by Pol Pot as dirty. That’s one quarter of the whole population. How does that make you feel? Pol Pot had a vision for Cambodia to be completely self-sufficient. So he set about to achieve this by arresting the well educated, teachers, doctors and anyone else who posed a threat. His Khymer Rouge soldiers would load prisoners into trucks and send them off to one of the thousands of fields all over the country. It is here that they would meet their demise. Most would be killed the night they arrived but towards the end, when the number of arrivals continued to increase, prisoners would be housed in a pitch black shed with no food or water, not knowing what was going to happen. The tour is marked out by numbers and on the journey around the fields you are subjected to harrowing personal stories of encounters, facts and figures about the fields and visual references. The most memorable for me being the old thick tree, which was used to hang a speaker, which would play music to drown out the screams of people dying. How did people die? Bullets were too expensive, so axes, knives and bamboo sticks were far more common. Some guards even used the thick trunk of a palm tree to slit the prisoners throats. If you were child, you would be beaten to death against a tree. We even passed a grave where hundreds of Khymer Rouge soldiers were buried. They were found with their uniforms on, decapitated. Pol Pot, growing ever paranoid during his rein, even turned on his own. The tour ended with a visit to the memorial building, which stands in the centre of the fields. Visitors can walk around the outskirts of a seventeen-story cabinet, which houses over nine thousand skulls. The skulls are colour coded, which enable you to get a better understanding of how each person was killed. Some had minor ruptures, others a large hole in the side of the skull. I looked up and saw rows upon rows of similar looking bone structures; all who once upon a time had different faces and features that would have been easily distinguishable. They are now unified together, with nothing to tell them apart but the legions that show how they were killed. I pictured faces staring back and tears started to form. Everything is hard to comprehend until you see it like this. I left with a sense of shame. I purposely didn’t take my camera because I knew that taking photos of pits in the ground that once housed hundreds, even thousands of corpses wasn’t right. But as I was leaving I turned around and glanced at the memorial. “It’s beautiful”, I whispered as I took my phone out of my pocket and snapped it. The thousands of skulls all piled neatly on top of each other in a tall, narrow line, encased in an elaborate house were a thing of beauty. The beauty of what was in front of me completely juxtaposed by the darkness of the images in my head of what this land once was. Why do we decide to visit such sites? I felt guilty, but all guilt departed as soon as I realised that this is merely a learning exercise for the human race. I have no doubt that everyone who visits the killing fields at Choeung Ek felt the same as I did. So we are not visiting to sensationalise, it’s to learn about inhumane events like this and to tell others to ensure that hopefully this does not happen again.